I was also at this concert. I just realized after reading Bill Vanek's comment that I bought the referenced B-3 from Mark Shestina along with his 3 Leslies back in the early 90's for $900. The organ was pretty beat but it has the great gritty rock B-3 sound we love. I remember lugging this gear down from Shestina's apartment in the winter and hauling it back to Columbus. Funny enough it is in the shop getting some TLC right now not to mention a new fallboard which was broke off all these years. I had no idea after all these years that Wakeman played it. If Mark told me, I forgot. Classic legend to follow this instrument! Incidentally Mark was cousin to Dale Shestina, close friend of many of us back in the day from Fairview. Pretty sure he was at the concert with a bunch of us. Hi Paul Christensen and Paul Nickels! And a friend reminds me we all drank warm beer and orange juice in the locker room before the show. Can't get any better than that. Singer Dave Cordey and I played a few acoustic tunes as a last minute fill in opener. Jerry Gildenmeister knew me from the band RappRascal. I was actually a bass player but Dave and I had been working on a few songs together. We had not performed together I don't think. Jerry called me that morning asking if we could play and also Yes needed to use the Hammond B-3 our keyboardist Mark Shestina had. It was hilarious watching Mark sitting on the bench with Rick Wakeman,showing him the broken keys etc on that poor old organ. All the guys, particularly Jon and Steve, were so nice in the locker room before the show. I think I told Steve he couldn't watch me play! I think we did a Blind Faith tune and a few others, and maybe an original, quickly we were done and off beside the stage watching a great show by an outstanding progressive rock band. Now, it's a great fun memory from a former life long ago. I remember this show vividly. Yes was my favorite band and I thought they were miles ahead of anything going on musically at the time. Five of my friends and I piled into a car and drove from Cleveland to Elyria to see them. 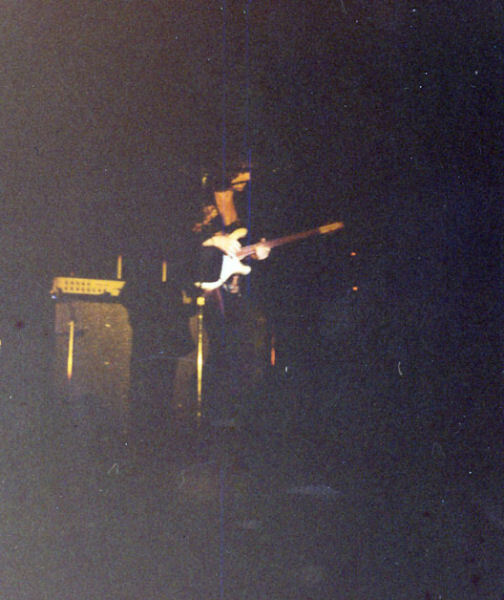 We sat on the gym floor right in front of Steve Howe who literally burned up the fret board that night. I recall my friend Paul Schwartz, a great guitarist himself, saying Eric Clapton was no longer his favorite guitarist after watching Steve Howe play. I don't remember the name of the opening act but it was a small acoustic group which, as someone pointed out, played some Cat Stevens tunes and a couple of originals. We were so impressed, we immediately bought tickets for the show at the Allen Theater in December. Jonathon Edwards of "Sunshine" fame, opened that show and received kudos from Jon Anderson no less for his performance. One other thing I remember was losing my wallet from sitting on the gym floor. It was returned to me several weeks later in the mail, without the cash, of course. All in all, a great show and maybe the best of the four concerts I saw between 1971 and 1974. I was always glad I saw them in saw them in such an intimate setting before they became huge stars. It's wonderful to see these photographs. i came across this today .was surprised to see it.i was in a band called IZZ who was booked by J&J attractions.along with tyrant.we were at our guitar players house getting in the right mental state to go to the yes concert at elyria catholic high.we suddenly got a call from john hedges of J&J.he wanted us to open for Yes.well, we were in mo shape to do it.all of our equipment was somewhere else and it would have been a disaster to do it.we suggester that they get tyrant to open for them but its like Paul said.they did a lot of Yes stuff.so they got a few guys to do the acoustic thing at the last minute.we also look back and regret the missed chance.we did however go to see them.they were great. My brother had an agency called J & J Attraction. They were responsible for booking Yes at Elyria Catholic. His agency also booked Heart that played at the old A & P out by Midway Mall. I had just turned 21 when Yes played Elyria Catholic High. The bleachers were definitely in use (friends & I sat in them). 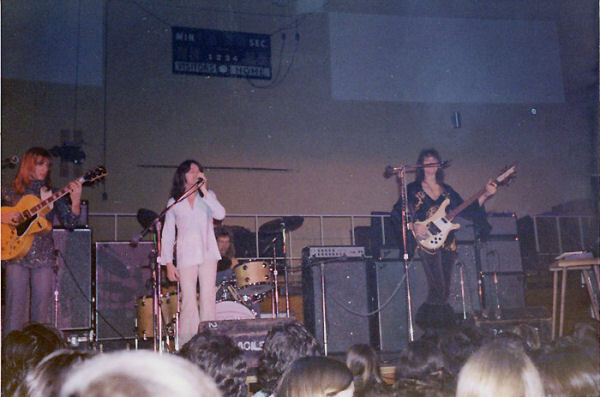 The band were already performing songs from "Fragile", which had yet to be released (26 November 1971 (UK) and January 4, 1972 (US)). Within weeks of the show they became a Big Time Act, as Fragile garnered radio play and sold well. 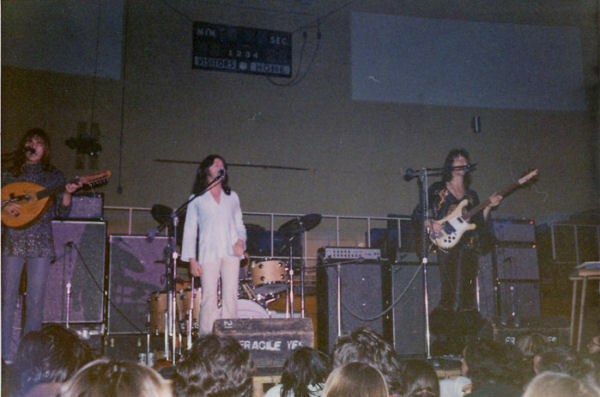 They played a high school gymnasium, because when the show was booked....they simply weren't well known yet. Kudos to whomever was cool enough to already know who they were & book them. PS: Paul, I used to see your band Tyrant at Cyrus Erie West! As a fan of Prog, I always looked forward to your gigs there. This was my very first major concert and being in my small hometown of Elyria made it even more memorable. Yes was my favorite band of the time along with ELP. 16 years old and I was a drummer in a local rock band so I was in Heaven. At best count I've seen TES 17 times and all their shows are a blessing. I attended ECHS ('88) and I never heard that Yes played there. The pictures do match up with my memories of the basketball court. Can anyone tell me why YES played this relatively small town 20 miles west of Cleveland? Being 14 years old at the time, this was the very first concert I had ever attended. I walked the 5 blocks to the show. The Gymnasium floor was covered with a tarp to protect the basketball court and I sat crosslegged on that(no chairs! )about 5 rows back directly in the center. I don't remember if the crowd was big enough to warrant the bleachers being pulled out. The opener was a local act(whose name somehow escapes me now! )who did alot of Cat Stevens and other acoustic songs-all covers I believe. I remember one of the nuns coming out onstage in full habit and announcing that unless everyone stopped smoking there would never be another rock concert there again. It didn't stop, and to the best of my knowledge, there never was again. During the many years the venue hosted Bingo Nights following, the smokers were accomodated with ashtrays at tables(chairs, too! Not that sitting on the floor was a big problem for a 14 year old). I'd imagine their brand could be bought in stores, though, unlike the various sundries being bandied about by the audience that day! During Yes' set, one of the bandmembers(can't remember which) jumped up into the air, and upon landing took out one of the electrical patchcords for the somewhat rudimentary light show, resulting in an unplanned mid-show timeout, during which the High School's fortyish(he seemed so old, then!) Maintenance Man came out onto the stage with his trusty toolbelt, and with assistance from a bandmember(the one who caused it(? )-not sure)managed to get SOME lighting working, though not all of the synchronized colored lighting. My friend Leroy got into the show for free after it had started just by conning the doorman and saved his cool 4 dollars-or-so of allowance money that the show costed. Even though I was somewhat jealous of that, it certainly didn't detract from my enjoying a great show! Damn, "Tall Paul", those are excellent pix of early Yes! Thanks for sharing. I was at my booking agents office (J&J Attractions) when the contract with rider came in for the Yes show at Elyria Catholic H.S. I happened to be there because my band (Tyrant) was handled by that same agency and J&J was promoting the concert. We looked through it and it specified "Yes" needed to be picked up at the airport by chauffered limo's and I immediatly volunteered myself and my cadillac along with another of my bandmates luxury cars and our services. You have to understand, we were serious devotees of Yes. We played alot of their music at the time along with Brian Auger, King Crimson, ELP, Procol Harum and much more. We were fanatics in every sense of the word. We showed up at Hopkins Airport with a couple of friends and cameras. I was lucky enough to get Jon in my car..can't remember the rest of the guys in my vehicle, but I do remember Jon breaking into part of a vocal of one of their tunes and almost wrecking my car! We took the band and manager Brian Lane to the hotel in Elyria and hung around for awhile, then took them to the gig for sound check etc. My friend and I got to hang with them all day (all access) and it was just a thrill. The opening act could not make it to the gig because they were dumped on by a blizzard in Pennsylvania. At one point they literally asked if our band could open the show because they had no opener and we DIDN'T accept because we played mostly covers and alot of it was Yes music. One of the biggest regrets of my life. They ended up getting a last minute fill-in (a trio of local guys playing acoustic ala/CSNY, one of which was an ex-band mate of mine). The concert was great but let's skip to after the gig...We went back to the Holiday Inn and had dinner with the band, all paid for by the Atlantic rep..I think his name was Willie Smith. It was a blast but wait-it get's better. I took Chris Squire, Rick Wakeman, and Brian Lane to a party with me after dinner. It was in Avon Lake, Oh. We smoked a doob, and I remember Chris laying down on the floor at the party and putting Tarkus by ELP on the turntable (remember those?) saying he'd not heard it yet. You should have seen the look on my friends faces when I walked in this party with my good buddies-Yes. Later I took them back to the hotel and we parted ways but they left our names on the guest list for the concert at the Allen Theater in Cleveland for the following day I believe it was. I had a great dinner and conversation with Chris at Swingo's also and got to talk a little about my band with him and American music vrs. British. I've seen them several times since but never had any more communications with them. I wish they could hear me now. I saw yes play while I was in high school for the first of 14 times. 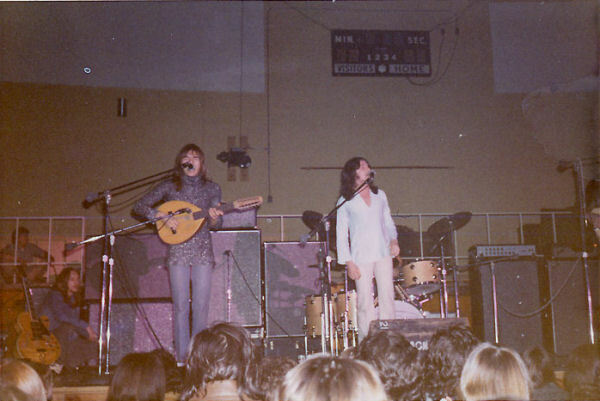 The show was at Elyria Catholic High School outside of Cleveland, and it was very cold, so I'm presuming it was winter. It was after the YES album, but just before FRAGILE was released. Rick Wakeman had just joined, I believe. It was a great show although RIck Wakeman appeared to be drunk (it was on a Sunday afternoon, and the NUNS who were doing crowd control were going nuts. Lots of dope being smoked, etc.